As we were thinking about making the annual trek around the house to assess how the roof held up over the winter (which the calendar does say should be over), we came across Martin Grohman’s name. He’s the Biddeford-based director of sustainability for one of the country’s biggest roofing companies, and we wanted to know what that means. Read on to find out about the roots of his green life (his mother is pretty famous), what role recycled roof materials played in paving his driveway and what you can do to make your own roof a little greener. GETTING THERE FROM HERE: Which came first, the interest in sustainability or the interest in roofs? Definitely the former for Grohman, who grew up in Carthage on a farm. And not just any farm. His mother is Joann Grohman, the author of “Keeping a Family Cow,” a mainstay of the homesteading community. When it first came out in 1975, it was self-published and called “The Cow Economy.” The idea was that a cow could provide the inputs for a self-contained and sustaining farm system. “We used to print it in the basement,” Martin Grohman said – for 12 years, while the family was simultaneously doing other print jobs like typesetting the earliest newsletters from the Maine Organic Farmers and Gardeners Association. “Then Scribner’s picked it up and we had a little run with it in the 1980s.” Chelsea Green republished the book in 2013. “We have sold about 60,000 copies. People all over the world have my mom’s book.” She, by the way, is 90, and still farming in Carthage. THE GREENEST ROOF: Installing a roof that can support a garden is one way of going super green. Grohman is a fan. “If you have ever been on a big garden roof, there is nothing more beautiful, with bees buzzing.” But, he said, it is expensive and not exactly easy. “A perfectly designed garden roof in a perfect world wouldn’t need maintenance but as a practical matter, they do.” Like irrigation or trimming. Sedum, a kind of succulent, is the usual medium, and it can handle extreme elements, like drought and cold winters. But his money for maximum sustainability would be on a well-insulated “cool” roof, ie one that reflects heat from the roof and cuts down cooling costs in hot weather. RECYCLED ROADS: In a place like Maine, where air-conditioned homes are few and far between, what is the most obvious way of making roofing more sustainable? Recycling the asphalt shingles that are used in most roofing jobs, Grohman said. We assumed that meant to make more shingles but we were wrong: “To build a system where your shingles come off the roof and get made into a road.” (Asphalt is a primary ingredient in both shingles and roads.) He worked to establish training programs for contractors to encourage recycling. 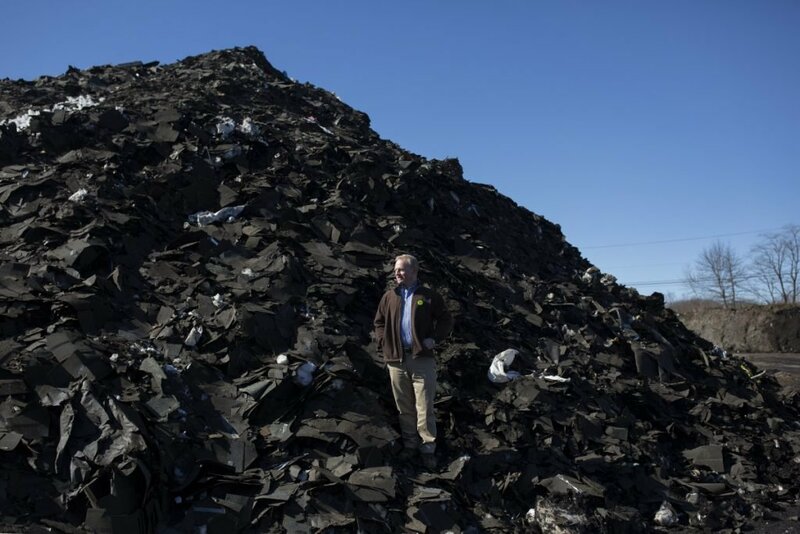 By his best estimate, “28 percent of shingles nationally are being recycled, we think.” In Maine, one of those companies is the CPRC Group, which collects shingles at locations around the state and recycles them in Scarborough (we photographed Grohman there). Shingles typically make up about 5 percent of the “recipe” for paving materials nationally, but when Grohman got his own driveway repaved, he had the paver bump the recycled shingle up to 20 percent of the mix. He blogs about issues like this for GAF.